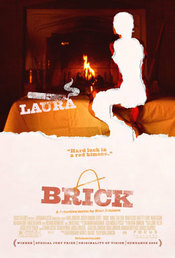 I had to stay in this morning to wait for some workmen, so watched Brick. Comparisons have been drawn with Donnie Darko and I can see why. If you liked DD then chances are you will like this. If you watched DD and could not follow what was going on, then chances are the elaborate vernacular employed in Brick will leave you confused and lost. I don't want to spoil the plot for those who've not see it, which makes it hard to say much. The basic story is that classic theme of teen flick, high school love. Yet Johnson gives it lots of new twists. The film Noir style works well and adds to the sense of intrigue. That many of the characters use nicknames, the brain, the pin, Dode adds to this. The main character is Brendan, who is meant to be a loner and outsider. It was a strong performance by Joseph Gordon-Levitt, but I could not buy the premise that Brendan was an outsider and a loner. His ex-girlfirend appeals to him for help and then pushed him away. He then finds her dead. In a rejection of power authorities common in these teen movies, and common among real life teens, Brendan does not turn to the police or authorities to solve this crime, but takes it on himself. This leads him into a cloak and dagger world of high school drug deals with an assortment of shady characters. Tugger is one of these key characters - he was meant to be the pin's muscle that is difficult to control - but both the character and the performance lacked the subtlety to make the character believable. That said it was a good movie and a nice break from the overly polished, easily predictable movie fair. As is was Valentine's Day yesterday Alison and I went out on a date. 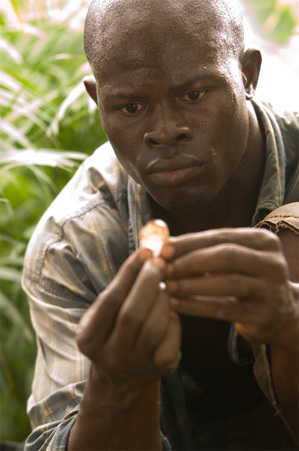 We ended up at the pictures and went to see Blood Diamond. If you want a good review of this movie then read Fernando's thoughts, he's a much better film reviewer than me! As we left the film Alison said, "so what can we do about this, after all we're unlikely to be buying anything with a diamond in it soon". I had been thinking the same thought and while the film had stirred me, made me aware of an issue that previously was not forefront in my mind, I felt that there was no appropriate response I could make. Oh what a limited imagination I have! Of course there's stuff we all can do in connection this this issue. The film ends with some slides giving stats about the blood diamond trade. One slide states that there are 200,000 child soldiers in Africa. 200,000. So here's the thought that came to me when I was praying this morning - what if we all donated the price of our cinema ticket and popcorn (if you bought some) to an organization that is working to rescue these kids, rehabilitate them and repatriate them with their families? My ticket was £6.25, popcorn £3.75 = £10. Why don't you blog this idea, talk to your friends about it, get your church, faith community etc., involved - let's not just be moved by a powerful piece of cinema, let's do something! HERE is one place you can give to and I'm sure there are many others. This Site gives some links so you can write and keep pressure on people connected with the diamond industry. Alison and I had a baby sitter last night so went out to see "The Pursuit of Happyness". Those of you who read the blog will have guessed that my spelling is rather poor (even using a spell check), so I was rather pleased that I noticed the Y in place of the I in the title of the film. You need to watch the film to understand why there is a Y and not an I. Despite the Happyness of the title this is not a happy film. Now I was in a melancholy and was experiencing a sense of liminality due to a meeting I'd had the day before, so my perception of the film is coloured by this. My perception was also coloured by my own family history. 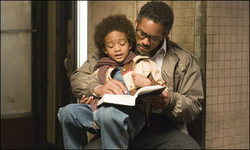 The film is the "true life" story of Chris Gardner. He sunk his life savings in a "new Technology" which he then struggled to sell, thus struggled to pay all the bills. His wife leaves him, but Gardner will not lettheri son go with her. His father was absent for much of his childhood and he promised that he'd never do that to his own child. Gardner manages to get an internship with a firm of stockbrokers, but this does not pay. Eventually he and his son become home less. I saw an interview with the real Chris Gardner who stated that 75% of homeless people in America are holding down a job - something I'm sure would go against popular public perception. Against all the odds Gardner's passes the internship and lands the job. It's at this point that the film ends, we last see Gardner and his some walking along a street telling jokes, but we don't know if they are going to a home a hostel or a motel. What we do know is that within a few years Gardner had become a very rich man. Lots of things hit me from the film, and if you were thinking about going to see it but were undecided then I'd encourage you to go. Perhaps the most pressing thought that I'm left with is just how easy it is to end up either homeless or in a vicious negative cycle from which it's hard to escape. There was not one big dramatic thing that pushed Gardner over the "edge", but the slow creep of many circumstances. The margin between his success and failure was paper thin. In this sense what happened to Gardner could happen to many of us - I can remember as a young QS being told "if you hear a company is in financial difficulty don't spread the word - given time they'll sort it out - but if everyone knows they're doing through a bad patch everyone will want their money at the same time, and it will be this that pushes them under". Si it can be with us - we can deal with the unexpected as long as it comes in dribs and drabs - but a flood..well that's a different proposition! I also wonder if Gardner (the real one rather than the film version) is still pursuing happiness? I'm left wondering if happiness by itself is worth pursuing? What I want to pursue is God's Shalom - which I think includes happiness but also a deep contentment a sense of wellbeing that goes deep. Yet I'm inclined to think that this is not something we can "posses" but must posses us as we learn to trust in God, as we learn to walk by faith. "the kind of thinking that will solve the world's problems will be of a different order to the kind of thinking that created them in the first place". It got me to thinking about praying in the Spirit or praying in tounges. Is part of what is going on when we "don't know what to pray so the intercedes for us with groanings too deep for word" (Rom 8:26), or we pray in tounges and the retional part of our brain (legt hand side i think) is less active? Thoughts on a postcard to....well the comments section! News broke late on Sunday night that Peter Jackson will not be part of the team set to make a film version of J RR Tolkien's "The Hobbit". You can read the email in which Jackson breaks this news Here. I've been watching the LOTR trilogy on Mondays (my day off) over the past few weeks. I love these films and what struck me again is that the way the story is told is great. To be sure the story Jackson had to work with is great, but the way Jackson and his team brought this to film was IMHO also great. So I'm sad that he will not be making The Hobbit. That said this Saturday a bunch of us will be watching all three of the extended versions of the LOTR's. The plan is to dress us - I'm thinking of going a Gimli but have not started on making a costume yet. The films will be shown in three different locations so we will have to "journey" as well. It will be a long day 8:30 am start with a finish around 11:15pm, but I'm looking forward to it. I'm thinking of holding a "Feast & Film" night were a bunch of us get together eat some nice food, watch a film and then talk about it. I was thinking of using Babette's Feast, so if you've seen the film or you've held a discussion group on the film I'd welcome your comments. Given my "low church" background my sacramental thinking is not what it would be had I been brought up, say an Anglican. But I think I'm getting there and hope that in watching this film together we might like the followers of the "prophet" in the film come to acknowledge and experience the sacramental texture and depths of everyday life, of the created order and discover the divine. and clears a path for his passage". - Psalm 85: 10 (The Message). I'm still taking a break from blogging but could not resist saying something about The Da Vinci Code which comes out in film later this month. Leaving Munster is bored by it all, but links to a large list of things written on the net about the book. The list contains the good, bad and the ugly so be warned! Andy rightly in IMHO, points out that the church is silent (avoids saying things) about films that are equally problematic as they support the myth of redemptive violence. As for me I'm looking forward to going to see the film. The book was enjoyable and Ron Howard is a good director so the film should also be good. I did a talk for Glasgow Uni CU of the Da Vinci Code and I've posted my handout below. My main thought on the topic is this, than in being zealous for the truth we as Christians often jettison grace. We need to be like Jesus, full of grace and truth. So I think making personal remarks that are negative about Dan Brown is just wrong. I also think that if we are to say why we think the book has got it wrong about Jesus and Mary being married and having a child we also need to admit that the church does not have a great record in the way it has treated women etc. So get talking about this stuff with your friend - but be full of grace and truth! Did you know that there are an estimated 27 MILLION slaves in the world today! Yet so few people seem to know about this issue. I spoke at Equip a while back and mentioned to the students that there are more slaves in the world today than in the entire history of the transatlantic slave trade. To say their response was one of utter disbelief would be an understatement.